Erin Rizzone, owner-stylist (left) Michaela Flak stylist. At a time when many say the economy is not good and it’s hard to start a new business today, many do follow their dream, and some survive to see the 5 year anniversary. Erin’s Hair Garage in the Edinboro Commons Mall is one of those businesses. Erin Rizzone the owner of the Hair Garage had an idea and a dream for her own salon, but an idea that was hers for a different kind of salon. She wanted a place that just about anyone could relax and feel comfortable, and really just about everyone feels comfortable hangin’ out in the garage with friends….. it’s almost the most used spot in the house for some. Erin took that idea and created a very unique business, a salon with garage “stuff” on the walls, signs & license plates, diamond plate everywhere, and the work stations are tool boxes like you would see in a well stocked garage. Erin’s idea was a hit from the beginning, and everyone man, woman, and child enjoy getting a “Tune-up” at Erin’s Hair Garage, and even clients bring things for Erin to add to the garage motif and 5 years “down the road” the Hair Garage, has a different look than opening day. To celebrate their anniversary you will find specials on many of the Matrix products they carry, and you can also enter to win a $100 gift card Erin’s is giving away the last day of March. 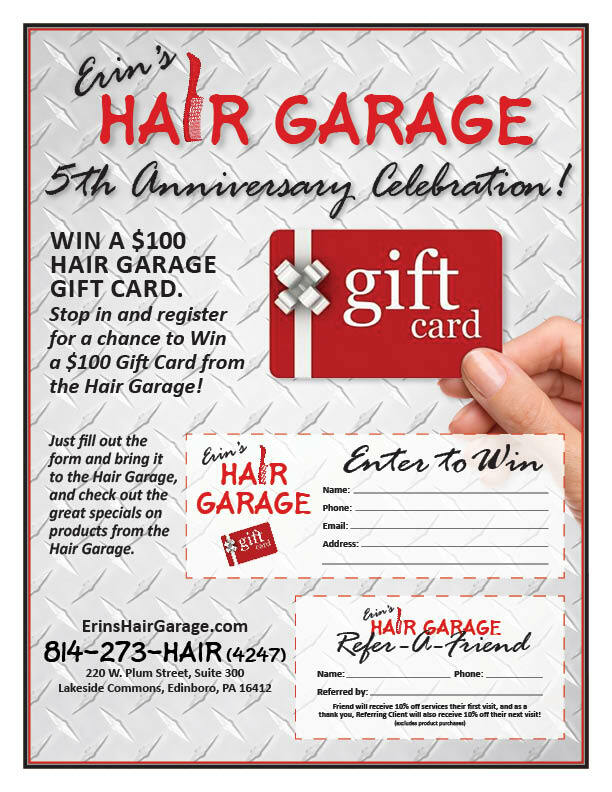 If you like you can sign up for Erin’s “Stay Tuned” newsletter and receive regular discounts on Garage services, or just stop by the salon and fill out an entry form to win the gift card. Erin’s Hair Garage is located in the Edinboro Commons Mall, they are open daily, Tuesday through Saturday, check their website www.ErinsHairGarage.com for hours and services offered.